[Stride] (Released when both players’ vanguards are grade 3 or greater! )-Stride Step-[Choose one or more cards with the sum of their grades being 3 or greater from your hand, and discard them] Stride this card on your (VC) from face down. 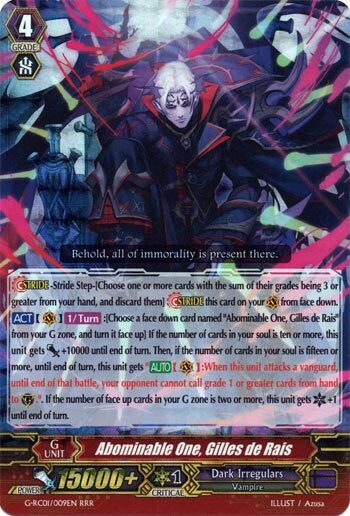 [ACT](VC)[1/Turn]:[Choose a face down card named “Abominable One, Gilles de Rais” from your G zone, and turn it face up] If the number of cards in your soul is ten or more, this unit gets [Power]+10000 until end of turn. Then, if the number of cards in your soul is fifteen or more, until end of turn, this unit gets “[AUTO](VC):When this unit attacks a vanguard, until end of that battle, your opponent cannot call grade 1 or greater cards from hand to (GC).”. If the number of face up cards in your G zone is two or more, this unit gets [Critical]+1 until end of turn. He had a good run, but we’ve got Balaam now, who is basically this except better. And in terms of keeping him as a just-in-case finisher, his slot could be taken up by another pair of Bledamaus. Seriously, you’ll want to go into him again rather than Gilles de Rais as long as G Guardians exist to make this less potent.